list the structures derived from each pharyngeal arch, and name the cranial nerve associated with each arch. describe development of the thyroid gland. It is a reminder that we still use embryonic processes that first arose in early chordate ancestors. During the 4th and 5th weeks of development, the human embryo closely resembles a fish embryo. In particular, the series of parallel ridges seen on the side of the future head and neck region (in relation to the pharynx) resemble the developing gill arches of the fish embryo. This resemblance prompted the earlier embryologists to refer to the corresponding arches in the human embryo as branchial arches, where ‘branchium' means ‘gill'. (Not to be confused with ‘brachium', which means ‘arm'!) 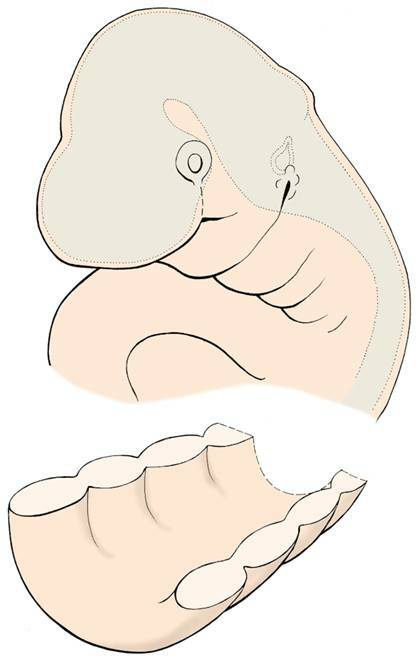 However, at no stage do perforations occur between the arches of the human embryo - as they do in fish embryos to form the gill-slits - and it has now become more acceptable to refer to these structures as pharyngeal arches, rather than branchial arches. Be prepared to hear both terms - clinicians especially will tend to refer to branchial arches, branchial cysts, etc - but try to use the term ‘pharyngeal arches' when you can. A total of six pairs of pharyngeal arches develop in cranio-caudal sequence. The first arch is complex, and contributes to both upper jaw and lower lower jaw. The 5th arch is very rudimentary in the human embryo, and difficult to define. The external surface of the embryonic pharyngeal region is covered with ectoderm, and the internal aspect lined with endoderm. Between these layers is a core of mesoderm. Between successive arches, there are indentations - both on the external (ectodermal) aspect and the internal (endodermal) aspect. Those on the outside are called clefts, while those on the inside are called pouches. They will be used frequently as we study development of this region. 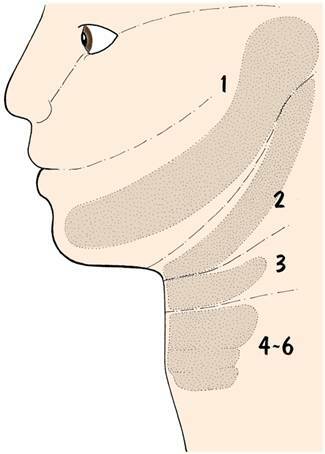 The mesodermal core of each pharyngeal arch differentiates into three main types of tissue, and each arch becomes associated with a particular cranial nerve. arterial arch (which may or may not be converted into a definitive major artery). The Table below summarises these important relationships between the arches, their derivatives, and cranial nerve supply. You will find that a clear understanding of these relationships between pharyngeal arches, derived structures, and nerve supply will be of great help when studying the arrangement of the head and neck and disorders of development in those regions. on the inside of the embryonic pharyngeal region are endodermally-lined grooves between adjacent pharyngeal arches. They contribute to the development of a surprising diversity of structures, ranging from the middle ear cavity to endocrine glands and components of the lymphatic system. The last two pouches are difficult to distinguish clearly, and are often considered as a single unit. are ectodermally-lined grooves on the outside of the embryonic pharynx. 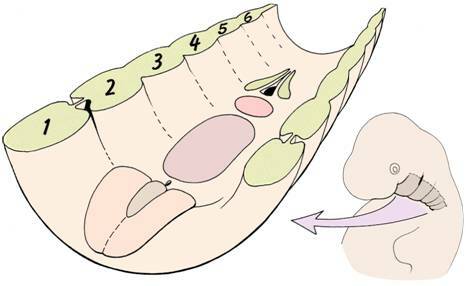 Only the first cleft is important - it develops into the external auditory meatus of the ear and provides the outer epithelium of the tympanic membrane. It used to be believed that the remaining clefts were ‘submerged' beneath overgrowing folds and then disappeared, but more recent work shows that the clefts simply ‘fill out' by proliferation of the underlying mesoderm. You have probably noticed that the tongue has a complex nerve supply - 5 different cranial nerves are involved. It is however possible to make sense of this by learning about the embryological origin of the tongue. Note that the tongue develops in the floor of the pharynx in relation to the ventral ends of the pharyngeal arches. Most of the musculature of the tongue is derived from myoblasts which migrate in from the first four somites - the occipital somites. The only exception is palatoglossus, which develops from mesoderm in the facial region. The occipital myoblasts bring with them their nerve supply: the hypoglossal nerve (cranial nerve 12). The course of the hypoglossal nerve as it loops down and around the great arteries of the neck before turning up into the tongue reminds us of the migration made by the myoblasts. The body of the tongue is formed by the fusion of several mesodermal swellings, and the nerve supply to the endodermal epithelium which covers them is derived from the neighbouring pharyngeal arches. In addition to the general sensations of touch, pain, pressure and temperature we must also take into account the special sense of taste. As you study development of the tongue, notice how the thyroid gland originates from the endoderm near the centre of the tongue, and then begins a long migration down into the neck region. It remains linked with the tongue for a while by a duct - the thyroglossal duct - but normally this connection disappears by the end of the embryonic period, leaving only a small depression (foramen caecum) in the surface of the tongue. Whenever you hear about sequences of development that involve the migration of cells or structures, bear in mind the possibility that this migration may go wrong, with cells going too far, or stopping short of the correct destination, or migrating to one side or another of the correct path. Read in your textbooks about the abnormalities of this type affecting the thyroid, parathyroid, and thymus glands. What names are given to the main subdivisions of the first pharyngeal arch? In relation to which pharyngeal arches does the ear develop? Initially, the entrance into the mouth is closed by the buccopharyngeal membrane. This marks the transition from the ectodermal stomodeum to the endodermal foregut. Thus, which parts of the definitive mouth have: a) an ectodermal origin? b) an endodermal origin? Describe normal development of the mandible. Is it formed by endochondral ossification or intramembranous ossification? Explain why the muscles acting on the ossicles of the ear have different nerve supplies. What is meant by the first arch syndrome? Why is the second pharyngeal arch sometimes called the hyoid arch? Which branch of the vagus nerve supply the developing larynx? Is there anything unusual about the course taken by these nerves? What is the embryological origin of the tympanic membrane (eardrum)? What happens to pharyngeal clefts 1 - 4? Which migrate further during development - the superior parathyroid glands or the inferior parathyroid glands? List the cranial nerves supplying the tongue. What is the embryological explanation for these supplies? How do the palatine tonsils develop? What is a branchial cyst? How can it be distinguished from a thyroglossal cyst? What is a lingual thyroid? When does the tongue become mobile?